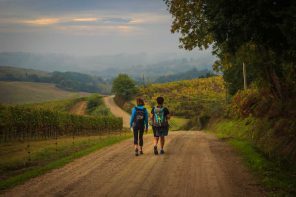 Whether it’s a quick business trip to a city less than two hours away or boarding a long-haul transcontinental journey, a good or a bad flying experience can set the tone for rest of your trip. 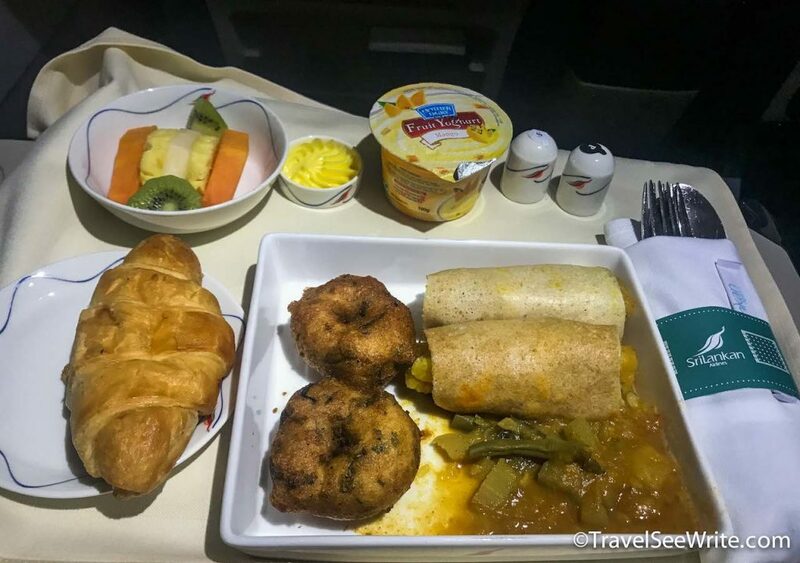 Here’s my experience of flying both Srilankan Airlines Business Class as well as Economy from Delhi to Colombo and back. Flights are just meant to transfer you from one place to another. Why waste my money on them? But when I fly on work, I insist to fly only on a full-service carrier. These are some of the usual responses I get when I ask people about their preference for flights. Low-cost airlines have definitely changed the game and democratised the flying experience, which was a privilege of few before the no-frill airlines entered the scene – 70s in the US, 90s in the Europe and 2000s in Asia. However, with the competition sky high in the aviation industry, there is not much difference in the fares of the budget and full-service carriers. And, I always say that paying a bit extra for an added comfort is not an expense but a wise investment. Also, my experience with an airline doesn’t begin at bag drop – it begins online when I book my flight. A comfortable journey in the air directly impacts your next day. So, I always choose comfort over saving a few bucks. I recently flew Srilankan Airlines Business class. Here is what I experienced. Honestly, I had heard very little about the airline before I started planning my trip to Sri Lanka. Additionally, being an Asian Carrier, I wasn’t expecting much from the airlines. 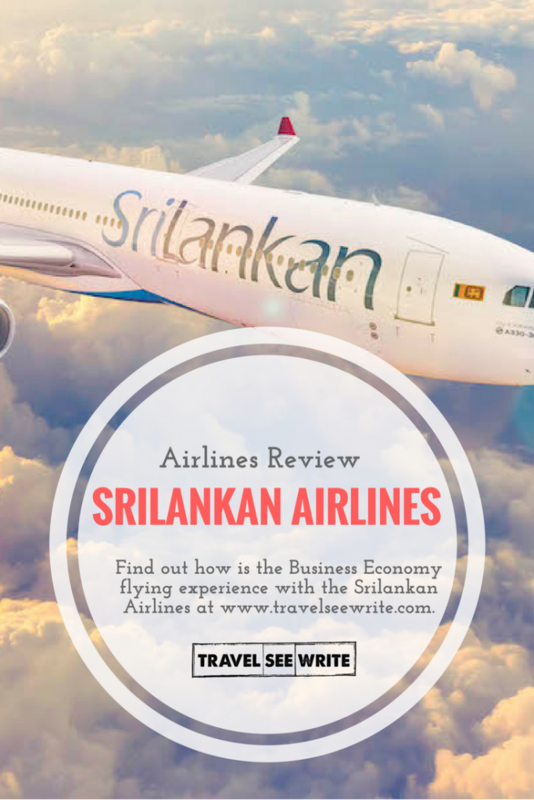 I thought Srilankan Airlines would be either worse or at par with other Asian Airlines (except Singapore Airlines, which is in a different league altogether). I was mentally prepared for having bad food, congested seats, and late departure. I was super delighted with their service and it set a beautiful precursor to my unforgettable trip to the island nation. Despite having a long queue of customers and serving at an odd hour i.e. 2:30 am, the ground staff was very warm, courteous and checked in with a big smile. The check-in was quick and flawless. Luckily, I was flying Business Class so the process was even smoother. There was a separate entry for business class. As I boarded the plane, a hostess with 100 watts CFL bulb smile wearing the country’s national costume, the osariya based on the pattern of a peacock welcomed me with both her hands held together close to the heart and softly saying “Ayubowan”(the word used in Sri Lanka to greet someone). I kept my luggage in the spacious overhead cabin and comfortably settled in the reclining seats that could fit a person double my size. The welcome continued with the amazing drink choices and warm towel. And that was just the beginning of the amazing service to follow, their food and beverage collection was impressive. I ordered a vegetarian meal prepared with lip-smacking Sri Lankan curry flavours. There was also a provision to pre-order meals in case you have dietary restrictions. 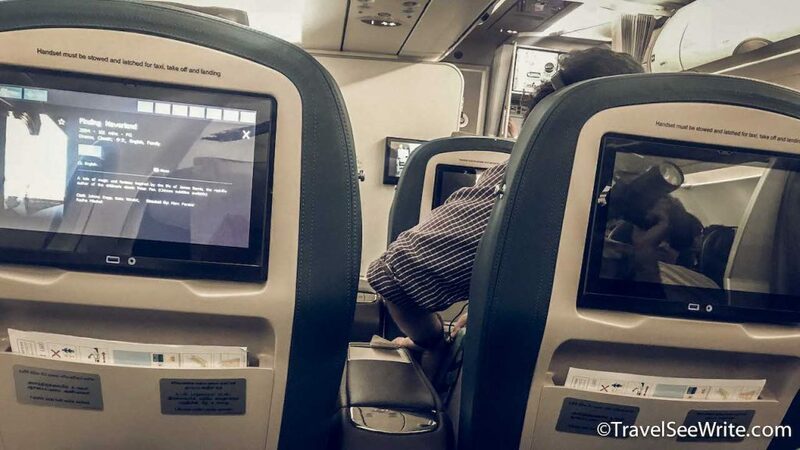 At the back of the seat, there was a state of the art AVANT in-flight entertainment system with the latest blockbusters from Hollywood and Bollywood, and a collection of classics and favourites. I felt I was sitting in my living room with a 15.4-inch screen with over 50 TV channels, 120 movies, an extensive library of audio CD’s and radio channels, and many games for all age groups. There was also a USB outlet to charge your phone or iPad. Headphones were noise canceling so you really get transported into your entertainment zone. I usually fill up my movie quota during my flights but it was an odd hour of flying and I hadn’t slept for a second in the last 48 hours, so I decided to give my eyes a bit of rest and be in the dream world by listening to the soothing instrumental music playing on the noise cancelling headphones provided by the Sri Lankan Airlines. Along with the Business Class travel, comes the added benefit of Lounge Access at Colombo. I was a bit late reaching the airport, therefore, I couldn’t spend as much time at the Lounge as I wanted. 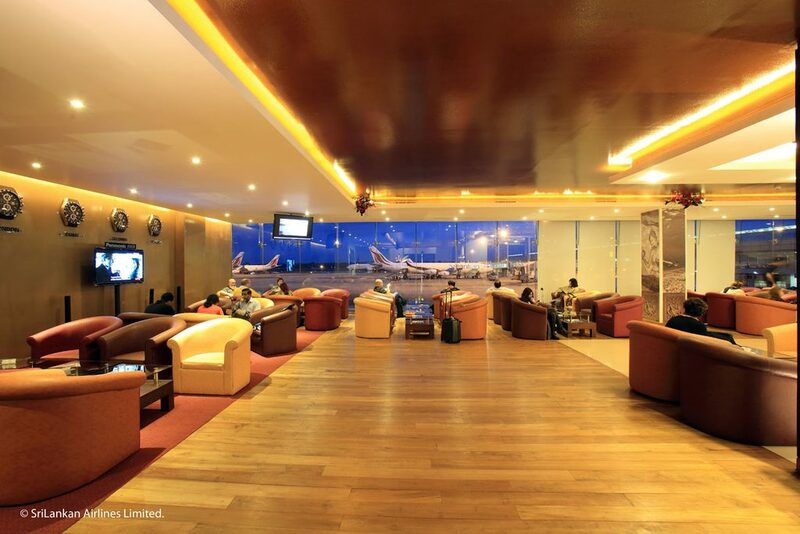 Located on the first floor of the departure hall at BIA, overlooking the Aircraft Parking Bay, “Serendib” is an exclusively branded SriLankan Airlines Lounge for its most valued premier customers. There was a good variety of food like pasta, breads, curry etc. to choose from. Also, a big bonus was the complimentary 15 min massage sessions. All the stress of airport walking and carrying around bags vanishes with the most rewarding foot massages and Ayurvedic balms. Unfortunately, I had to miss this one too. While returning from Colombo, the flight was completely booked and I couldn’t get a business class, so I flew in Economy. The experience was good. Although, I did feel a bit cramped in the seats, which is common for flying economy with any airlines. I was flying early morning, so I gave my dinner and in-flight entertainment a miss. The landing and cabin service was fantastic. 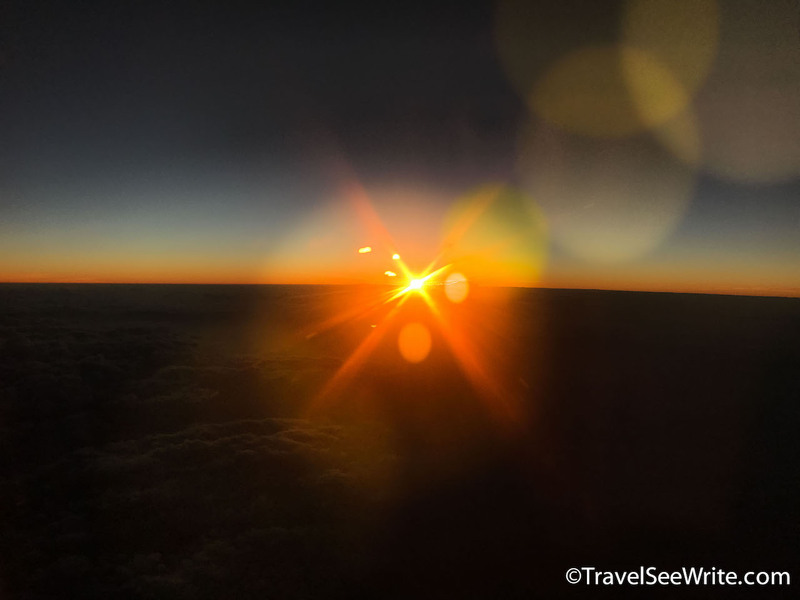 The icing on the cake was the magical sunrise with cloudscape from my window seat at 37,000ft above ground level. The majestic rays illuminated the horizon in yellow-orange light and the fluffy clouds danced in choreographed steps. Having flown in some of the best airlines, I have experienced more luxuries, better gadgets, and amenities. 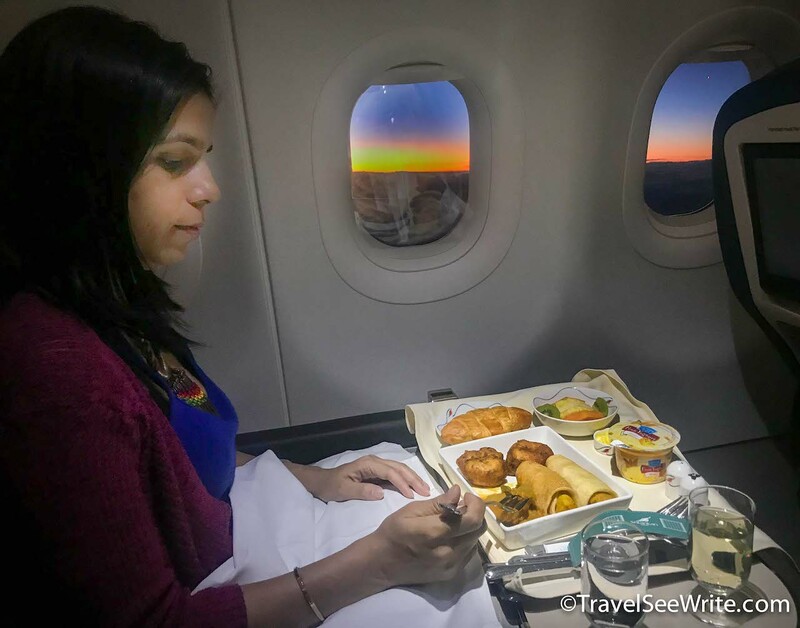 However, when it comes to hospitality, Sri Lankan Airlines Business class can match any top carrier with its warm hospitality. And, it wasn’t just business class, even in the economy the staff made sure my journey was comfortable. 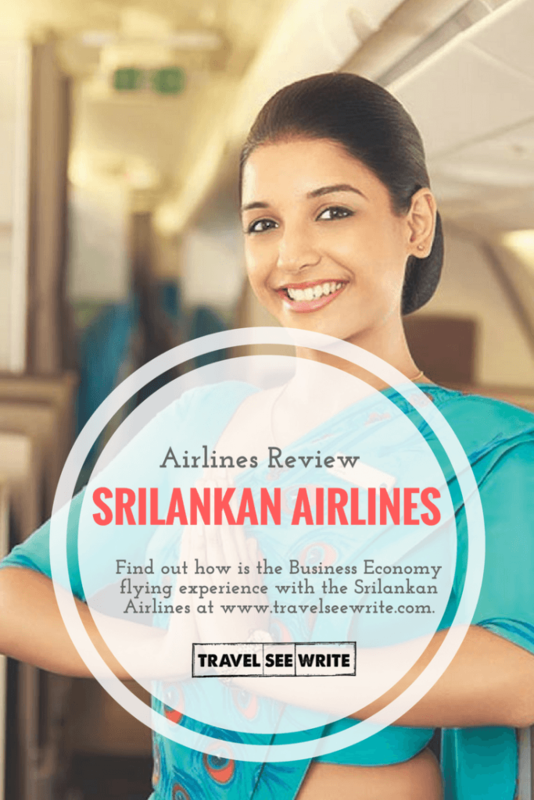 Have you flown with Srilankan Airlines Business class? How was your experience? I would love to know your thoughts. 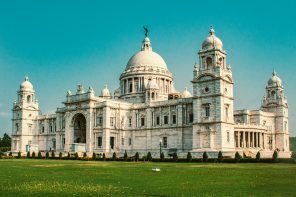 PS: In my next articles I am going to share my experience of visiting the Pearl of the Indian ocean and how every nationality that has visited and traded over the years has left its mark – the Dutch, Portuguese, English, Arabs, Malays, Moors, and Indians. 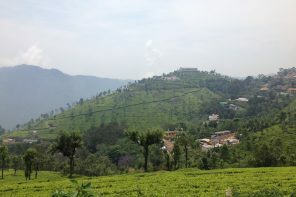 I went to Sri Lanka on invitation on Srilankan Airlines with Outbound Konnections. Views expressed above are mine and based on my personal experiences. All the photos posted are either clicked by me or provided by the airlines. On really long flights we splurge on business class. It makes it easier to sleep and I feel like you gain so much more on your trip since you don’t arrive worn out that it makes it worth it. We’ve not flown this airline and it looks like a nice experience. 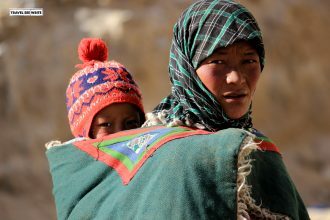 Even the uniforms are a cool peak into another culture. Love the colors. I’m okay with spending a little more on longer-haul flights if it means a good experience. I haven’t flown with Sri Lankan Airlines before, but based on what you’ve described, I would be all for it. That lounge looks amazing and your view of the sunrise must have been magical! 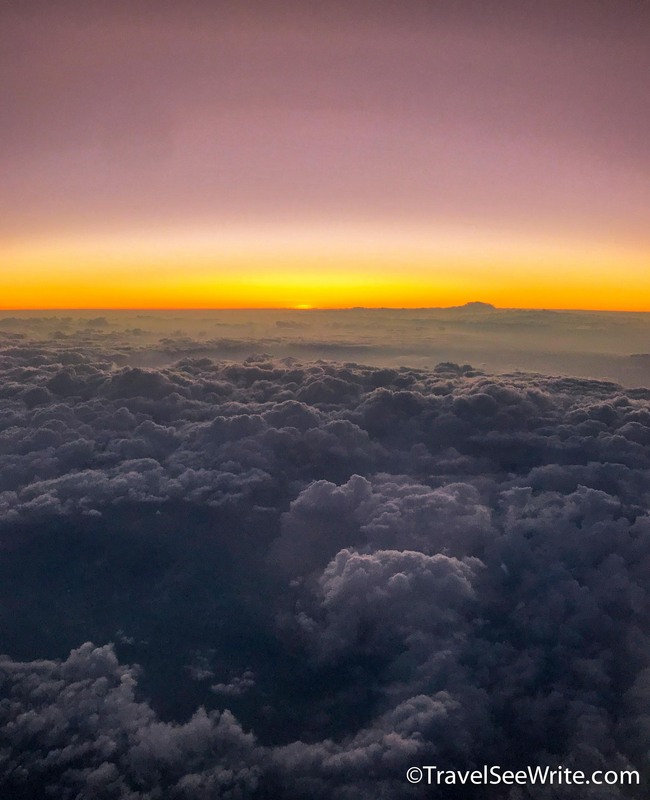 You chose a great time to fly, the sunrise looks spectacular! I have flown Sri Lankan once, when I was flying from Dubai to Maldives and I agree, the experience was really good. Noise cancelling headphones, good food and in-flight entertainment that offers a variety of shows and movies, plus of course, USB charging port for my phone, these small added benefits really set one economy airline apart from another. I have never flown with Sri Lankan airlines before but after have been reading your post I might give it a chance! Although, business or first class is out of the question for us so it was great reading your review of the economy class as well. Our next flight will be to Thailand from Switzerland so who knows we might fly with Sri Lanka airlines! My experience with Srilanka has been decent. We once flew business class to Maldives via Colombo which was excellent. Then another time just to Colombo in economy which was decent as well. I have flown all sorts of airlines, and aside from a few higher class ones, I find them much the same. 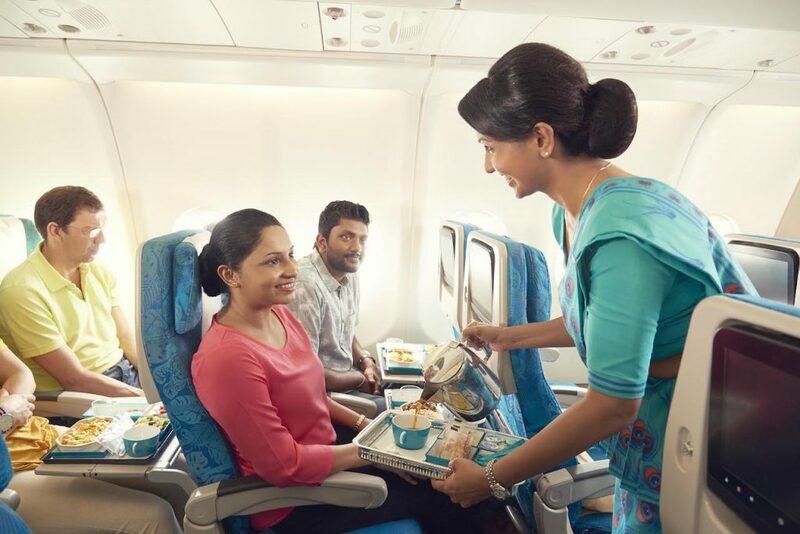 Sri Lanka Airlines looks to be great for the food and the wonderful service. I love the uniforms too, with the peacock sash! 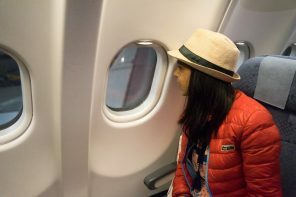 I had the same perception before but after flying business class — I found the huge difference and it is definitely worth it. As long as the funds and budget allow it — then, go ahead take a business class. The travel experience starts during the flight. 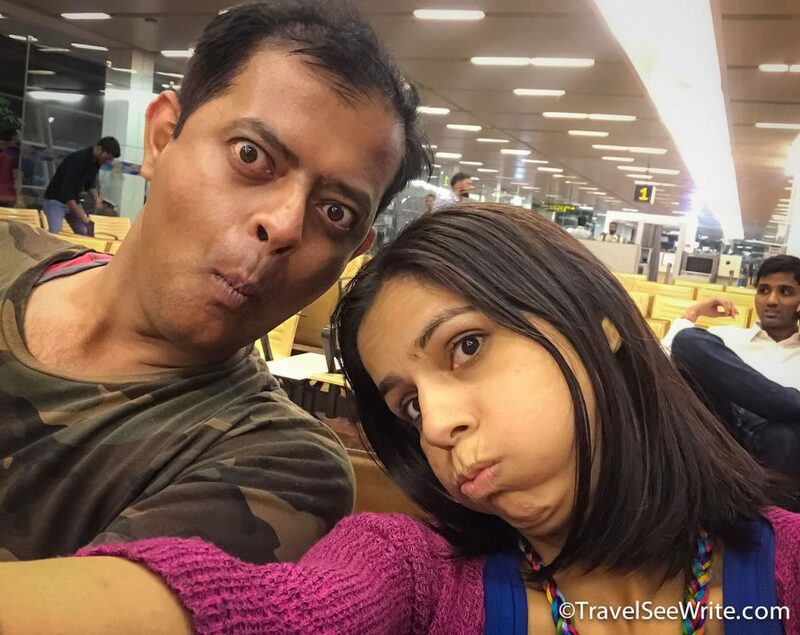 We were expats in China for a bit and flew throughout Asia with smaller Asian airlines and they were quite literally, the nicest flights we have ever experienced. We have flown first class, business class and economy with numerous airlines, and frankly some of the worst are US based. 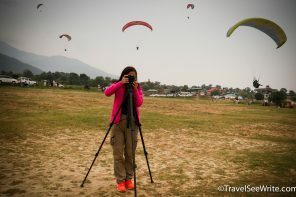 I definetly stand into to “Flights are just meant to transfer you from one place to another.” category but it’s nice to read that you had a great experience with yours! 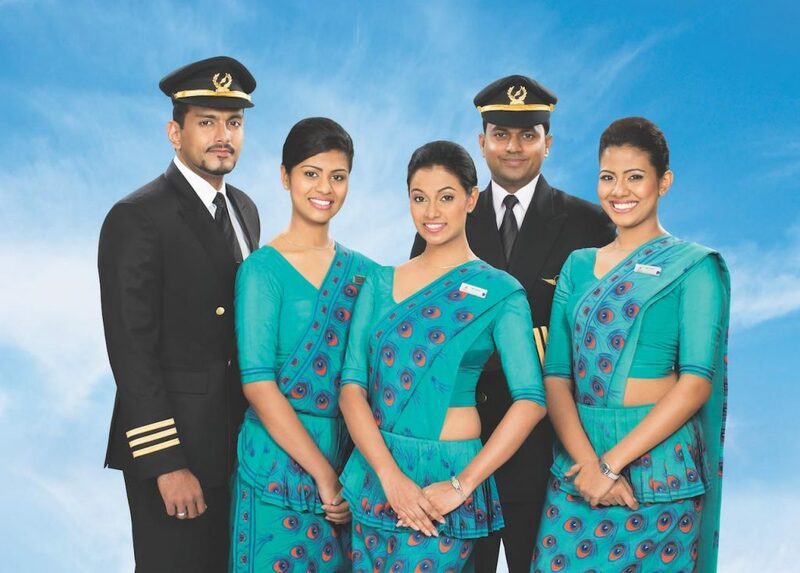 Those uniforms are incredible, so nice to hear that you loved your flight, it sounds like a great experience! I fly often, but I’ve never flown with this airline. I will say that I used to prefer saving money on the flight as I only viewed it as a form of transportation (and that’s still the case on short flights). But now, if I have to be a long flight, I definitely choose comfort. Business class gives me the food, the entertainment and the relaxation I need so I don’t feel grumpy when I get off the flight. Sounds like a fine airline to try. How cool that you flew Business Class one way! I’m heading to India next year and will look into flying on Sri Lankan Airlines for sure. I’m not surprised to hear that you had a pleasant surprise with Srilankan Airlines. They are trying hard to make a name for themselves. It’s the more established and older airlines who don’t care anymore to please their customers. 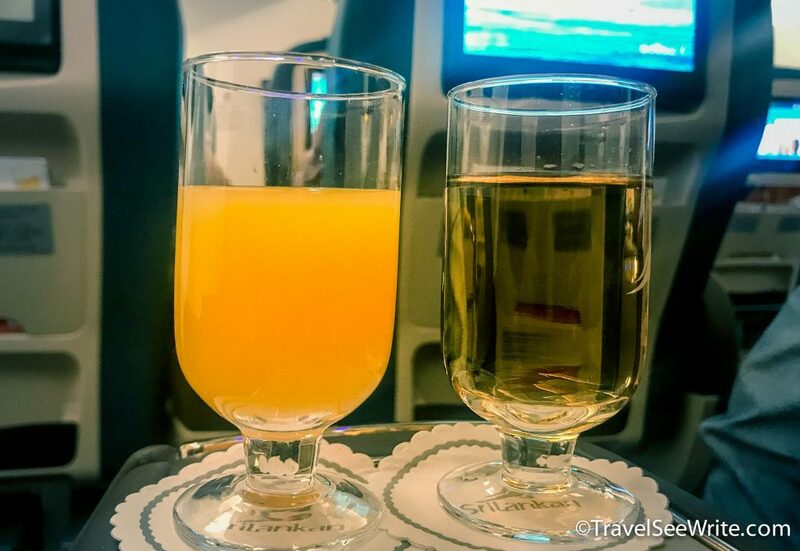 I traveled business class recently on LATAM airlines and was very pleasantly surprised too. I’ve never been to Asia before, but if I go I’ll give Srilankan Airlines a try. The food looks pretty delicious! 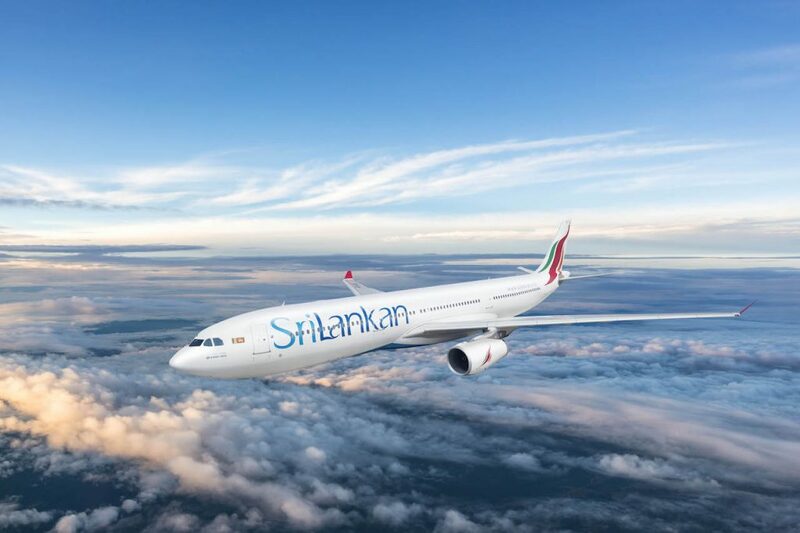 I would love to fly with Srilankan airlines one day in business class. Even the lounge looked like luxury. Interesting read. 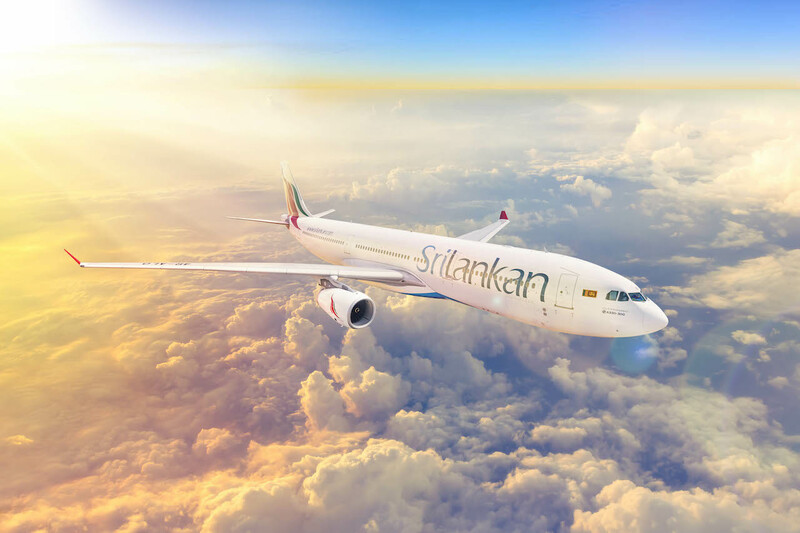 I haven’t flown Srilankan but after reading your post, they will certainly be an option when I have the opportunity to fly with them. The quality of service sounds amazing and that alone is worth it. So many airlines don’t have decent service anymore and while I prefer a less cramped seat, I’ll take a cramped seat with great service any day. 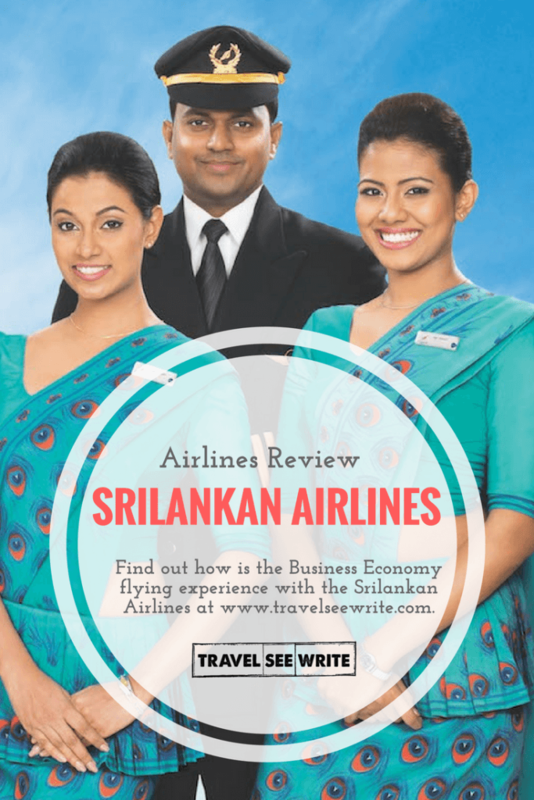 I don’t hear a lot of reviews for Sri Lankan airlines, so thanks to this as they will always be one of my options now! And wow, that lounge looks really luxurious! I’ve never travelled with Srilankan Airlines. Good to know that you managed to experience both economy and business class in the same trip. The food looks super yummm. The Business lounge looks super stunning!!! Nice review Archana. The Sri Lankan airlines seems to be setting up the good standards. You choose the perfect time to fly too. I loved the sunrise with so many clouds picture. Food too looks quite good and the smile of that girl is really heart warming. The airline looks great! 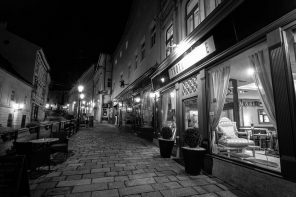 It’s not always easy to find good service anymore, so it’s nice to read about your good experience. And a free massage in their lounge sounds awesome! That is definitely something to look forward to! I have flown with Srilankan Airlines while traveling Malvides. I had a great experience flying with this airlines. The most courteous staff and also hospitality was really good. For me, now that I can afford to upgrade to premium economy, and occasionally business class, I do like to do so but reserve it for longer flights. For a few hours, I’ll put up with economy but any longer than 5-6 hours and I really appreciate having more space and comfort. Having better food and service is a nice bonus, but for me it’s the physical seats that make the difference. Interesting to see Sri Lankan Airlines offerings. 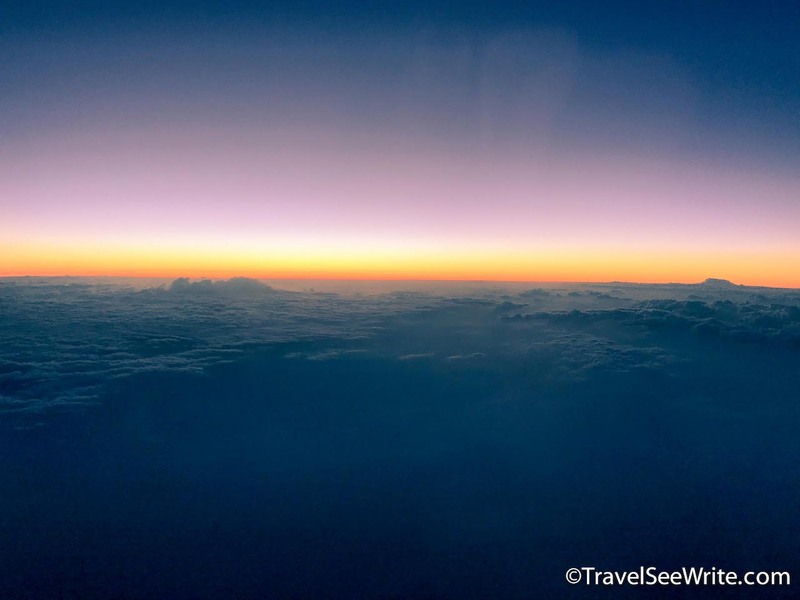 I’ve never flown Sri Lankan Air before but would absolutely do it after reading your post! The food looks delicious, and I’d love to get a message at the business lounge. I love the flight attendants’ uniforms too! They’re gorgeous and represent their country so well. Thanks for sharing all the photos! 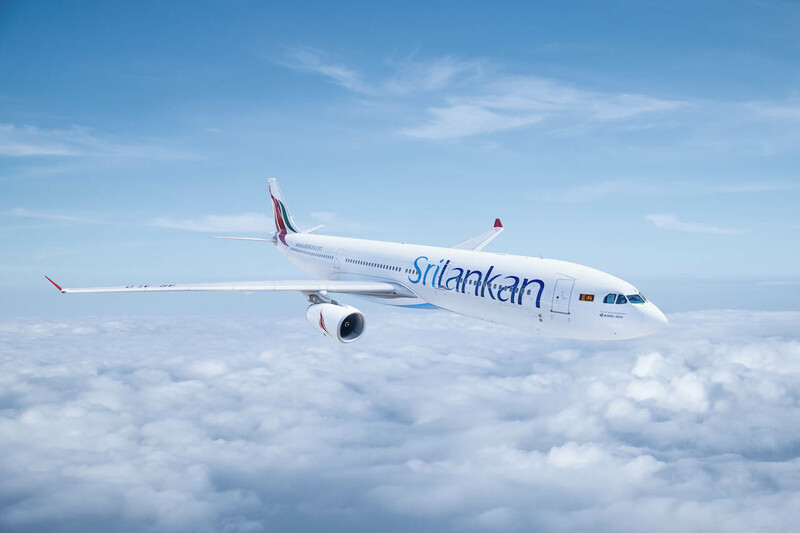 Glad that you had a great experience with Srilankan Airlines. I also used to think that flying premium was just a waste of resources but after seeing and experiencing the difference, paying for something premium is definitely a wise investment. I absolutely love flying Sri Lankan Airlines! Actually whenever I fly from UK to India I always try to go with either Sri Lankan, OmanAir or Emirates as I find the service on Air India to be consistently less than all of the above. 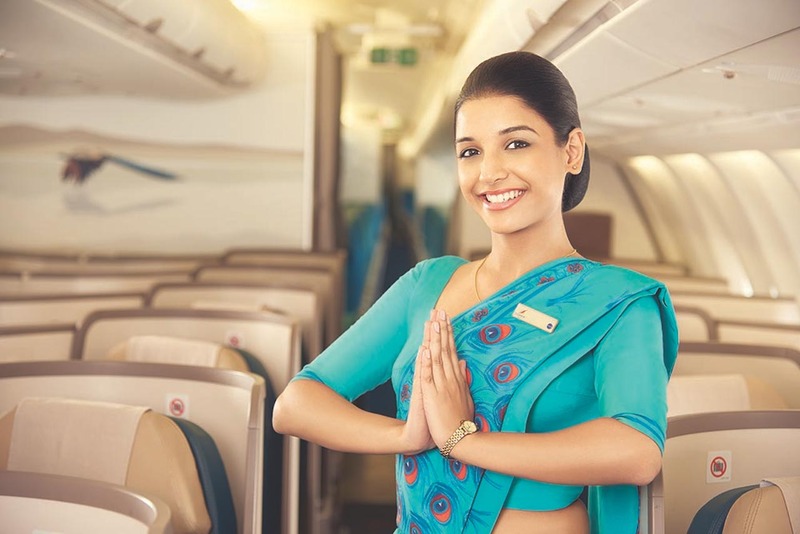 There’s something about the Sri Lankan hospitality, though, that really makes me smile, and the air hostesses always look so beautiful in their uniforms! Good review. Why spend money on flights when you can splurge on destination later was exactly my motto. But then a cramped up economy on a long haul flight changed it. It’s better to reach the place fresh and rested. Will check out this airline next time. We have flown with Sri Lankan airlines multiple times but don’t remember seeing an entertainment system. Good that they have it now. The lounge looks really good. I’m a flight attendant flying for Srilankan airlines and I just want to let you know that I’m beyond ecstatic to hear such lovely reviews and comments about our service and facilities. Hope to see you soon on a flight.